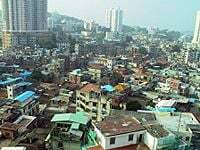 Fujian ▶ (Chinese: 福建; pinyin: Fújiàn; Wade-Giles: Fu-chien; Postal map spelling: Fukien, Foukien; local transliteration Hokkien from Min Nan or Taiwanese Hok-kiàn) is a province of China located on the southeast coast of the country. It borders Zhejiang to the north, Jiangxi to the west, and Guangdong to the south. Taiwan lies on its eastern border, across the Taiwan Strait. The name Fujian was coined during the Tang Dynasty, and comes from the combination of Fuzhou and Jian'ou, two cities in Fujian. Fujian, bestowed with natural beauty embracing ocean, mountains, and plains, has gained renown as an education center and pristine nature. The ecology of the province has been threatened of late by rapid economic advancement stimulated by proximity to Taiwan and ethnic ties with Taiwan. Isolated from the power centers of China by mountains and sea, Fujian became a easy target for Japanese encroachment and colonization during the late nineteenth and twentieth centuries. Most of Fujian is administered by the People's Republic of China (PRC). However, the archipelagos of Kinmen (formerly known as Quemoy) (Chinese: 金門; pinyin: Jīnmén; Wade-Giles: Kinmen) and Matsu (Chinese: 馬祖; pinyin: Măzŭ; Wade-Giles: Matsu) are under the control of the Republic of China (ROC) based in Taiwan. As a result, there are actually two provinces (in the sense of government organization) with the same name. The two sides use different romanizations of Mandarin to render the name of their respective provinces. The PRC side renders the name in Hanyu Pinyin, yielding "Fujian," while the ROC side renders the name of its province in Tongyong Pinyin, Wade-Giles and Postal map spelling, resulting in "FuJian," "Fuchien" and "Fukien," respectively. The existence of two parallel Fujian provincial governments is a result of the Chinese Civil War. After losing mainland China (including most of Fujian) to communist forces in 1949, the Republic of China retreated to Taiwan while retaining control over a few offshore islands of Fujian. Since then, the PRC and the ROC (Taiwan) have maintained separate provincial governments for the province. Fuzhou is the provincial capital of PRC controlled Fujian. Recent archaeological discoveries demonstrate that Fujian (especially the northern coastal region around Fuzhou) had entered the Neolithic Age by the middle of the eighth millennium B.C.E.. From the Keqiutou site (7450 B.C.E. - 5590 B.C.E. ), an early Neolithic site on Pingtan Island located about 70 km southeast of Fuzhou, numerous tools made of stones, shells, bones, jade, and ceramics (including wheel-made-ceramics) have been unearthed, together with spinning wheels, which serve as definitive evidence of weaving. The Tanshishan (昙石山) site (5500 B.C.E. - 4000 B.C.E.) in suburban Fuzhou spans the Neolithic and Chalcolithic Age, and the Huangtulun (黄土崙) site (1325 B.C.E. ), also in suburban Fuzhou, appears to be from the Bronze Age. These findings indicate that the agricultural tradition was weak if not lacking in this area, which is consistent with early records stating that the indigenous people in Fujian, primarily those living along the Min River, were Austronesians with "large eyes, flat nose and tattooed bodies," who made their living primarily by fishing. These people were probably the original inhabitants of southern China, and some of them may have been assimilated, driven further south, or exiled during the Han Dynasty to eastern China (north of present-day Shanghai). For the Han Chinese, this area was also known as Minyue. 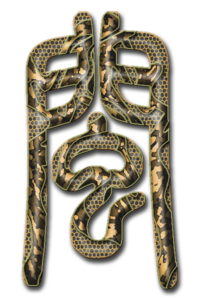 The word "Mǐnyuè" was derived by combining "Mǐn" (閩/闽; POJ: bân), perhaps an ethnic name and associated with the Chinese word for barbarians (蠻/蛮; pinyin: mán; POJ: bân), and "Yue," after the State of Yue, a Spring and Autumn Period kingdom in Zhejiang Province to the north. This is because the royal family of Yuè fled to Fujian after their kingdom was annexed by the State of Chu in 306 B.C.E. Mǐn is also the name of the main river in this area. Minyue was a de facto kingdom until the emperor of the Qin Dynasty, the first unified imperial Chinese state, abolished that status. In the aftermath of the fall of the Qin Dynasty however, civil war broke out between two warlords, Xiang Yu and Liu Bang. The Minyue king Wuzhu sent his troops to fight side-by-side with Liu Bang, and his gamble paid off. Liu Bang was victorious, and he subsequently founded the Han Dynasty, while restoring Minyue's status as a tributary independent kingdom in 202 B.C.E. Thus, Wuzhu was allowed to construct his fortified city in Fuzhou as well as in a few locations in the Wuyi Mountains, and the remains of these fortifications are the ones that have been excavated in recent years. It is believed that his kingdom extended beyond the borders of contemporary Fujian into eastern Guangdong, eastern Jiangxi, and southern Zhejiang. By this time, Minyue was being sinicized and had a combination of aboriginal (possibly Austronesian) and Han Chinese elements. After the death of Wuzhu, Minyue maintained its militant tradition and launched several expeditions against neighboring kingdoms in Guangdong, Jiangxi, and Zhejiang, mostly in the second century B.C.E., only to be stopped by the Han Dynasty. The Han emperor eventually decided to eliminate this potential threat by sending in large forces simultaneously from four directions via land and sea in 111 B.C.E. The rulers in Fuzhou quickly surrendered to avoid a futile fight and certain destruction, and as a result the first kingdom in Fujian history came to an abrupt end. Even so, the people of northern Fujian still erect many temples in memory of their first kings. After the Han Dynasty collapsed at the end of the second century C.E. , it paved the way for the Three Kingdoms era. Sun Quan, the founder of the Kingdom of Wu, spent nearly 20 years subduing the Shan Yue people, the branch of the Yue people who lived primarily in the mountains. The first wave of immigration of the noble class arrived in the province in the early fourth century C.E. when the Western Jin Dynasty collapsed and the north was torn apart by invasions by nomadic peoples from the north, as well as civil war. These immigrants were primarily from eight families in central China: Lin, Huang, Chen, Zheng, Zhan, Qiu, He, and Hu. The first four remain as the most common surnames in modern Fujian. Although Fujian had been administered by many different rulers during this time, its isolation from nearby areas due to its rugged terrain contributed to a relatively backward economy and poor level of development. Despite major population boosts from northern China during the "barbarian" invasions, the population density in Fujian remained low compared to the rest of China. Only two commanderies and 16 counties were established by the Western Jin Dynasty. Like other southern provinces such as Guangdong, Guangxi, Guizhou, and Yunnan, Fujian often served as a destination for exiled prisoners and dissidents at that time. During the Northern and Southern Dynasties era, the Southern Dynasties reigned south of the Yangtze River. Their sovereigns put significant efforts into populating the territorial area of what is now Fujian with Han Chinese. The Tang Dynasty (618-907) oversaw the next golden age of China, and as it ended, China was torn apart by the period of the Five Dynasties and Ten Kingdoms. During this time, a second major wave of immigration arrived in the safe haven of Fujian, led by general Wang, who set up an independent Kingdom of Min which had its capital in Fuzhou. After the death of the founding king however, Min suffered from internal strife, and was soon swallowed up by the Southern Tang Dynasty. 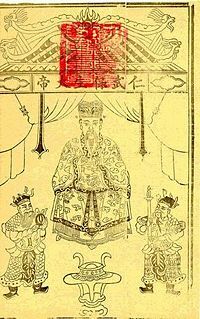 Old print sold in temples with a picture of Baoshengdadi, healing god in Fujian and Taiwan. Throughout this time, Quanzhou was blooming into a seaport under the reign of the Min Kingdom, and may have even become the largest seaport in the Eastern hemisphere. In the early Ming dynasty, Quanzhou was the staging area and supply depot of Zheng He's naval expeditions. However, further development was severely hampered by the sea trade ban of the Ming Dynasty, and the area was then superseded by the nearby ports of Guangzhou, Hangzhou, Ningbo and Shanghai, even after the lifting of the ban in 1550. The Late Ming and early Qing Dynasty saw a large influx of refugees and another 20 years of banned sea trade under the Kangxi Emperor, which was largely a measure intended to counter the Ming government of Koxinga in Taiwan. Incoming refugees however, did not translate into a major labor force, mainly because of their re-migration into prosperous regions of Guangdong province. In 1689, the Qing dynasty officially incorporated Taiwan into Fujian province, and the settlement of Taiwan by Han Chinese quickly followed. As a result, the majority of people in Taiwan are descendants of emigrants from Southern Fujian. After Taiwan was separated and formed into its own province in 1885, then ceded to Japan in 1895, Fujian was created and given its present borders. It experienced substantial influence from the Japanese after the Treaty of Shimonoseki of 1895, which lasted until the Sino-Japanese War (1937-1945) of World War II. Because of its rugged mountainous landscape, Fujian suffered from a lack of rail transportation and underdeveloped networks of paved roads before the 1950s. Without this transportation, it became one of the most secluded provinces of eastern China. The first railway to the province was completed in the mid-1950s, connecting Xiamen to the rest of the mainland. Despite its secluded location however, Fujian has had a strong academic tradition since the Southern Song Dynasty. At the time, north China was occupied by the Jurchen Jin Dynasty, which caused a shift of the cultural center of China to the south, benefiting Fuzhou and other southern cities. In the Chinese Academy of Science and Chinese Academy of Engineering, there are more members from Fuzhou than from any other city. In addition, it should also be pointed out that the slow development of Fujian in its early days has proven a blessing for the province's ecology. Today, the province has the highest forest coverage rate and the most diverse biosphere in China, whereas central China suffers from severe overpopulation and displays severe signs of soil erosion, accompanied by frequent droughts and floods due to lack of forest coverage. Since the late 1970s, the economy of Fujian along the coast has greatly benefited from its geographic and cultural proximity to Taiwan. In 2003, Xiamen ranked number eight in GDP per capita among 659 Chinese cities, ahead of Shanghai and Beijing, while Fuzhou ranked no. 21 (number 4 among 30 provincial capitals). This high level of development has been accompanied by a large influx of population from the over-populated areas in the north and west. Due to the combined factors of economic and population growth in the province, much of the farmland and forest areas, as well as many of the cultural heritage sites have given way to ubiquitous high-rise buildings, and the government has been forced to face the challenge of sustaining development while simultaneously preserving the unique and vital natural and cultural heritage of Fujian. Fujian is mostly mountainous, and is traditionally described as "Eight parts mountain, one part water, and one part farmland" (八山一水一分田). The northwest is higher in altitude, with the Wuyi Mountains forming a natural border with Jiangxi. The highest point of Fujian is Huanggang Peak in the Wuyi Mountains, with an altitude of 2157 m.
The province faces the East China Sea to the east, the South China Sea to the south, and the Taiwan Strait to the southeast. The coastline is ragged and has many bays and islands. Major islands off the coast of the province include Quemoy (controlled by the Republic of China), Haitan Island, and Nanri Island. The Minjiang River and its tributaries cut through much of northern and central Fujian. Other rivers include the Jinjiang River and the Jiulong River. Fujian is separated from Taiwan by the 180-km-wide Taiwan Strait. Some of the small islands in the Taiwan Strait are also part of the province, while some other parts, namely the islands of Quemoy and Matsu, are under the administration of the Republic of China in Taiwan. Fujian has a subtropical climate with warm winters. In January the coastal regions average around 7-10 °C while the hills average 6-8 °C. In summer temperatures are high, and province is threatened by typhoons coming in from the Pacific. Average annual precipitation is 1400-2000 mm. All of the prefecture-level cities except Longyan, Sanming, and Nanping are found along the coast of the province. The nine prefecture-level divisions are further subdivided into 85 county-level divisions (26 districts, 14 county-level cities, and 45 counties). Those are in turn divided into 1107 township-level divisions (605 towns, 328 townships, 18 ethnic townships, and 156 subdistricts). Note: these are the official PRC numbers. Thus, Quemoy is included as one of the 45 counties and Matsu as one of the 334 townships. Quemoy County is nominally controlled by Quanzhou prefecture-level city, but it is administered in its entirety by the Republic of China in Taiwan. 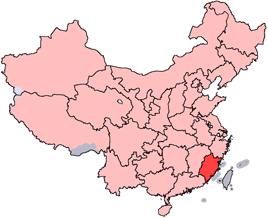 The PRC-administered Lianjiang County, under the jurisdiction of Fuzhou prefecture-level city, nominally includes the Matsu Islands, but Matsu is in reality controlled by the Republic of China on Taiwan, which administers Matsu as Lienchiang County (same name, but Romanized differently). See List of administrative divisions of Fujian for a complete list of county-level divisions. 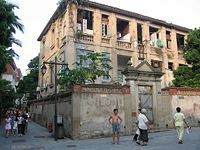 Xiamen with old and new buildings. Fujian is very hilly, and as a result, farmland is sparse. Rice is the main crop, and it is supplemented by sweet potatoes and wheat, while cash crops include sugar cane and rapeseed. In addition, Fujian leads the provinces of China in longan production, and is also a major producer of lychees and tea. Seafood (especially shellfish) is another important product, since it is also one of China's main fishing zones. Along with its agriculture, many mineral resources have been discovered in Fujian, including iron, coal, manganese, tungsten, copper, molybdenum, lead, zinc, and aluminum. The province has also formed a complete industrial system, with the petrochemical, electronics, machinery, construction, building materials, and light and textile sectors especially flourishing since the economic reforms of the 1970s. Since Fujian is blessed with a tremendous forest-cover rate, (which ranks first in the mainland) it is often referred to as the 'Green Treasury' and serves as one of China's largest forestry zones. Additionally, since there are lots of rivers with fast drifting speed and large dropping elevations, the province ranks first in hydropower in all of eastern China. Fujian is one of the wealthier provinces of China. Xiamen was one of the first cities in China to be classified as a Special Economic Zone, and since then there have been many more. Currently, Fujian has 34 counties operating as special economic zones, technological development zones, or economic open zones. Because of the closeness both geographically and culturally with Taiwan, Fujian also receives a great deal of foreign investment from there, contributing even more to its economic prosperity. Fujian's economy has continued to grow in the early twenty-first century. In 2005, Fujian's nominal GDP was 648.7 billion yuan (US $81 billion), an increase of 11 percent from the previous year. In 2010, Fujian's nominal GDP was 1.43 trillion yuan (US $212 billion), a rise of 12 percent from the previous year. GDP per capita was 33,051 yuan (US $4,890). By 2015, Fujian expects to have at least 50 enterprises that have over 10 billion yuan in annual revenues. The government also expects 55 percent of GDP growth to come from the industrial sector. Gulangyu Island (鼓浪屿), offshore the city of Xiamen (厦门), Fujian, China. Han Chinese make up most of the population. Hakka, a Han Chinese people with its own distinct identity, live in the southwestern parts of the province. Hui'an, also a Han branch with their own colorful culture and fashion, populate Fujian's southeast coastline near Chongwu in Hui'an County. The She people, scattered over mountainous regions in the north, is the largest minority ethnic group in the province. Genetic studies have suggested that a significant proportion of Han Chinese ancestry in Fujian descend (predominantly matrilineally) from pre-Sinicization aborigines. Many ethnic Chinese around the world, especially in Southeast Asia, trace their ancestry to Fujian. Descendants of Fujian emigrants make up the majority of the ethnic Chinese population of Malaysia, the Philippines, Taiwan, Singapore and Indonesia. Fujian, especially Fuzhou, is also the most significant source of undocumented Chinese immigrants that entering the United States. According to statistics taken at the end of 1997, Fujian had 28 institutions of higher education, with 131,300 enrolled students, and 9,800 full-time teachers. At the secondary school level, the numbers were 1,921 schools, 2,335,000 students, and 120,700 teachers. The numbers for primary schools were 13,939 schools, 3,691,000 students and 183,500 teachers. Note: Institutions without full-time bachelor degree programs are not listed. Xiamen University campus, viewing from "Furong 7" students dorm. Because of the numerous waves of migration from central China throughout the course of its history, Fujian is one of the most linguistically diverse places of all the Han Chinese areas of China. Local dialects can become unintelligible within 10 km, which is well reflected by the local expression: "if you drive five miles in Fujian the culture changes, and if you drive ten miles, the language does." Classification of these various dialects has confounded linguists. In general, most dialects of Fujian are put into a broad Min category, then subdivided into Min Bei, Min Dong, Min Zhong, Min Nan, Pu Xian, and Shao Jiang. (The seventh subdivision of Min, Qiong Wen, is not spoken in Fujian.) The Fuzhou dialect is part of Min Dong, but some linguists classify it as Min Bei, and the Xiamen dialect is part of Min Nan. Hakka, another subdivision of spoken Chinese, is spoken around Longyan by the Hakka people who live there. As is true of other provinces, the official language in Fujian is Standard Mandarin, which is used for communication between people of different localities. During the Qing dynasty, traders in Fujian also reportedly used pidgin English as a common language. Several regions of Fujian have their own form of Chinese opera. Minju (Fujian Opera) is popular around Fuzhou, Gaojiaxi is popular around Jinjiang and Quanzhou, Xiangju is popular around Zhangzhou, Fujian Nanqu is popular throughout the south, and Puxianxi is popular around Putian and Xianyou County. Some famous types of art in the province includes Fuzhou bodiless lacquer ware, a famous type of lacquer ware that is renowned for its use of a body of clay and/or plaster to form its shape, with the body later being removed. Fuzhou is also famous for Shoushan stone carvings. Fujian cuisine, with its strong emphasis on seafood, is one of the eight great traditions of Chinese cuisine. It is composed of traditions from various regions, including Fuzhou cuisine and Min Nan cuisine. The most famous dish is Fotiaoqiang (literally "Buddha Jumps Over Wall"), a complex dish making use of many ingredients, including shark fin, sea cucumber, abalone, and Shaoxing wine (a form of "Chinese alcoholic beverage"). Fujian is blessed with a rich history, famous historical sites and beautiful natural landscapes. Although these make Fujian a unique tourist attraction, it has not received the amount of attention among tourists that some of the other provinces of China have received. Oldest mosque in China, in the city Quanzhou, Fujian province. Nine-bend River in the Wuyi Mountains, Fujian Province, China. Statue of Lu You on Nanji Hill in Jiaocheng District, Ningde, Fujian, China. ↑ 2.0 2.1 These are the official PRC numbers from 2009 Fujian Statistic Bureau. Quemoy is included as a county and Matsu as a township. ↑ Kwang-chih Chang and Ward H. Goodenough, "Archaeology of Southeastern Coastal China and its Bearing on the Austronesian Homeland" Transactions of the American Philosophical Society New Series 86(5), 1996, cited in Phyllis Ghim-Lian Chew, Emergent Lingua Francas and World Orders: The Politics and Place of English as a World Language (New York, NY: Routledge, 2009, ISBN 978-0415872270), 181. ↑ Wang Bo, Fujian GDP expected to hit 1 trillion yuan China Daily (2008-12-19). Retrieved October 14, 2011. ↑ Xinhua News Agency, Fujian achieves 11% GDP growth in 2005 www.chinaview.cn (2006-02-04). Retrieved October 12, 2011. ↑ Fujian Provincial Bureau of Statistics, Fujian 2009 Statistical Bulletin of Economic and Social Development www.tjcn.org (2010-03-02). Retrieved October 14, 2011. ↑ 7.0 7.1 Fujian Province The China Perspective. Retrieved October 14, 2011. French, Howard W. "Uniting China to Speak Mandarin, the One Official Language: Easier Said Than Done" New York Times, (July 10, 2005). Overview of Fujian China Internet Information Center. This page was last modified on 15 May 2017, at 21:02.